The Opera AdBlock Configurator helps you to configure Opera's filterlist. 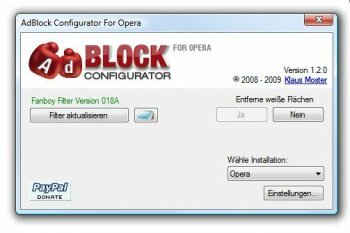 With this list, Opera can block ads on websites. Very good utility. Also works well with the Opera 11 Beta. A Plus. Looks great, how does it work, do I just run it, update filter and close it? is that it? Works great. Click on the box in the lower right to get an English version.